Photography: A Victorian Sensation at the National Museum of Scotland is the first major exhibition in Scotland to concentrate on the science, technology, popularity and social history of early photography. There have been significant exhibitions celebrating the art of photography and justifiably so as Scotland has an unrivalled photographic history with some of the greatest early practitioners. But Photography: A Victorian Sensation presents an all encompassing perspective, from how photography works, and the processes that produced the photographs, to how photography impacted on Victorian society. There is also a timeliness about the exhibition, in that it highlights how history can reveal similarities in human behaviour. The sensation of photography that captured the imagination of the Victorians having parallels with the obsession of the current ‘selfie generation’. This association is reinforced by the vast number of photographs on display. Many are of people and are ordinary in quality, but these images would have had personal and emotional significance to their original owners and viewers. The exhibition starts at the very beginning of photography, with the rival processes invented by the Frenchman, Louis Daguerre, and the Englishman, Henry Fox Talbot, both announced in 1839. The Frenchman’s daguerreotype can lay claim to the first practical form of photography but the process only produced a single image on a silvered copper plate. Each is exquisite in detail and enclosed in an ornate protective case. Daguerrotypes, indeed, are endearing, intimate objects and this can be appreciated from the extensive selection on display. Daguerre’s invention did create huge public interest but as a process it was soon overtaken. Talbot’s calotype is what is understood as ‘photography,’ because it produced a negative from which numerous positive prints could be made. It is this ability to reproduce and distribute images that made photography so popular, although not with Talbot’s calotype process. A Victorian Sensation outlines the science behind the daguerreotype and the calotype. The display of apparatus used for each method are tangible links to the inventions of Daguerre and Talbot, revealing the endeavour, inventiveness and perseverance of these two men. An understanding of the complications and uncertainties involved in making photographs greatly adds to an appreciation of the works produced. This is particularly the case with the photographs on display by the Scottish pioneers, D O Hill and Robert Adamson, who used the calotype process, because while others saw photography as a scientific experiment, Hill and Adamson were raising it to the level of an art form. The daguerreotype and calotype, despite widespread public interest, were still photography for the few. It was in 1851 that the floodgates of ‘photography for all’ began to open and the story of photography in Victorian times is one of technological innovation and enterprise catering for an ever expanding market. In that year Frederick Scott Archer announced his wet collodion process, and at the Great Exhibition at the Crystal Palace in London the lenticular stereoscope, invented by Sir David Brewster, was displayed. Archer’s process replaced Talbot’s paper negative with glass which made the production of small portrait photographs much simpler and cheaper. This was responsible for the massive expansion of photography, coupled with a rising public appetite to own photographs. The wet collodion process was used to produce distinctly different products. 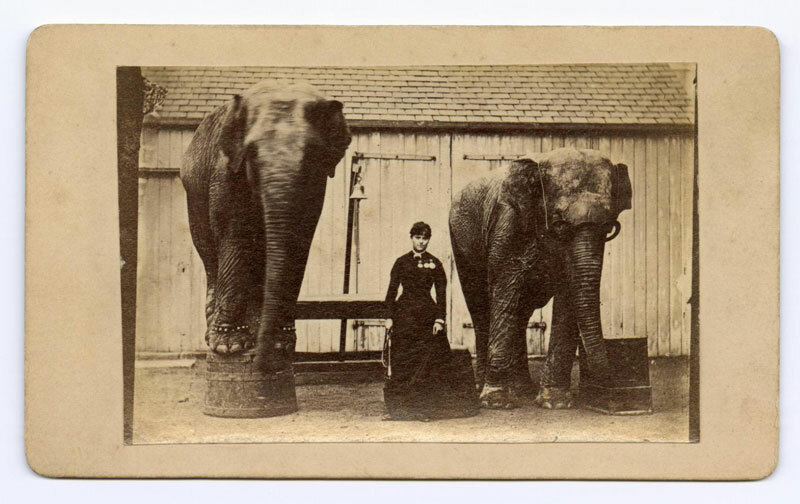 The ambrotype was usually in a case, similar to the daguerreotype, but the carte de visite, a small photograph on card, had the greatest impact. Ordinary people could have their portrait taken and be able to give copies to family and friends. The carte de visite also had Royal approval. Queen Victoria was regularly photographed and copies were widely distributed and avidly collected. The tintype was affordable to those of the most modest means with itinerant photographers catering for demand. There is a tactile quality and intimacy about these Victorian photographs as objects. That the Victorians themselves interpreted them this way is evidenced by the practice of incorporating photographs into jewellery which was widely worn, and the exhibition shows photographs of sitters wearing jewellery with photographs framed in it! 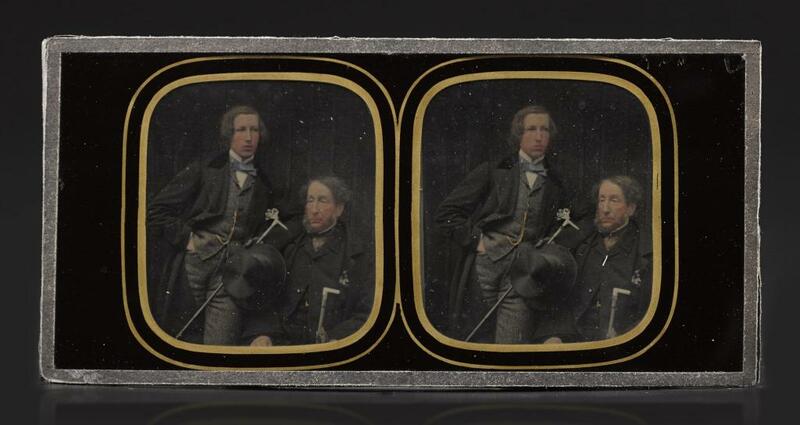 The stereo viewer was a revelation at the Great Exhibition and the 3D image that could be seen from a pair of photographs mesmerised the Victorians. The viewer became the must have object of every Victorian household and various types were produced for different pockets and which type a family bought could be seen as a reflection of their social status. Vast quantities of stereo cards covering endless subjects were produced, particularly of far off places and it is difficult to over-estimate how the stereo viewer informed the Victorians of the wider world. Photography was very much a commodity in an increasingly industrialised and consumer society. The range of images and equipment on display emphasises this but also provides keen insight into that society. Looking at old photographs is always absorbing and can be captivating and there is endless opportunity with so many on display. The use of modern digital photography has enhanced how we understand Victorian images, and many can be greatly enlarged and seen in revealing detail. These can be arresting and puzzling. 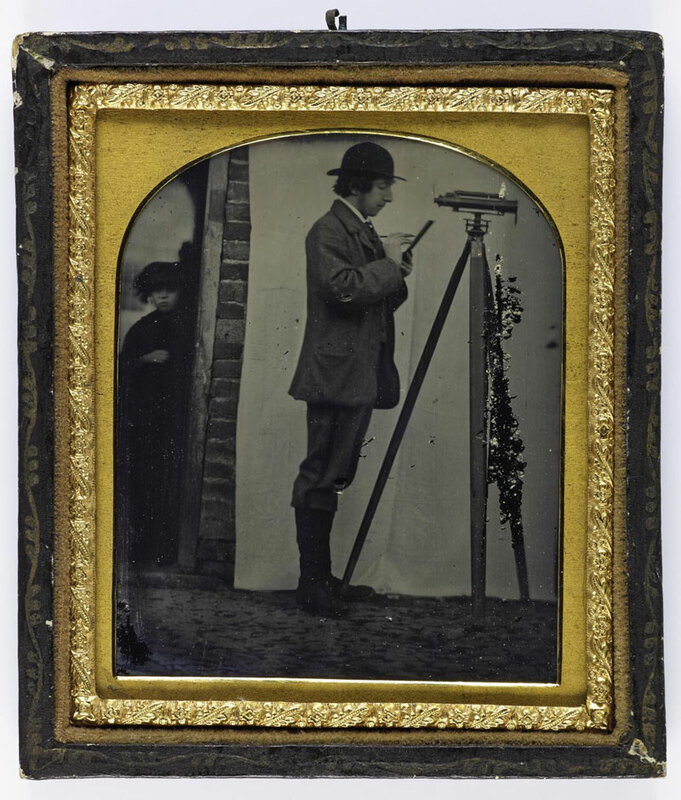 In this exhibition, for example, there is the smart surveyor in his bowler hat, standing in profile beside his tripod and theodolite, but lurking behind at the side is a young girl. Or there is the elephant wearing glasses. This is an exhibition that can be appreciated and enjoyed at different levels, from looking at the photographs, to understanding the practicalities of early photography, and the demands and expectations of popular culture, but it is the combination of these which give the most illuminating and lasting impression. Photography: A Victorian Sensation is unusual for a major exhibition as it draws almost exclusively from the National Museums of Scotland’s own collection, and especially from the remarkable collection of Bernard Howarth-Loomes. This not only shows how rich the collection is but also raises the question of why these items are not seen more often? Photography: A Victorian Sensation is at the National Museum of Scotland, Chambers Street, Edinburgh, until 22 November 2015.